It’s not too hard to figure out where this dream of mine came from. I have a big yard with lots of trees. Sometimes they fall down. It happens. It especially happens along the creek that runs through the yard–no doubt the creak was instrumental in bringing the seed (or nut, in the case of the walnut trees) that turned into the trees along its edge, and it’s also the instrument of their demise, as the ground is washed away from under the roots. A couple of years ago, a large walnut tree fell across the creek, making a fascinating bridge (mostly for squirrels). Last winter, another walnut tree tipped in the opposite direction and leaned against a larger walnut. It remained alive, and even shot new limbs from much lower on the trunk than it would have if it had remained upright. Lately, that tree has been slipping lower. It’s final collapse is now only a matter of time, and every time I go by–which is every day, since it’s on the path the dog and I take on our Noon walks–I wonder when that will happen. Judging by my dream last night, I’d say soon. In the dream I was using a handy new tool–a laser pruning device–to trim the branches from very high in a tree in the yard. We’re talking skyscraper high. I wasn’t too skilled at using the pruner, though, and I cut too much. A big chunk of that tree came crashing down, but it fell not in my yard but on a tree in the neighbor’s yard, bringing that tree down with it. And then a huge walnut tree in the neighbor’s hard also fell, just missing his house. Apart from thinking that the tree in my yard is doomed, I’m also wondering if I can get a patent on this laser pruner, which seems like a great idea–in the right hands. >I have a lot of mature trees, too, but I've never dreamed about them. 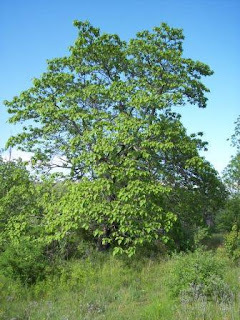 I also have walnut trees that my mother planted. Carpathian walnuts. The trees are huge! I love trees. Any book with trees on the cover will attract my attention immediately. If the book isn't my cup of tea, I wish it had been, I so love a cover with trees. Silly, maybe.